Well I am approaching the later?? stages of my first ever Alopecia Areata episode and things are getting sparse. And in a complete reversal of feelings – I am happy about it! Summer is approaching, it’s getting too hot to wear a hat all of the time – and I would rather be full on bald than patchy and scratchy. 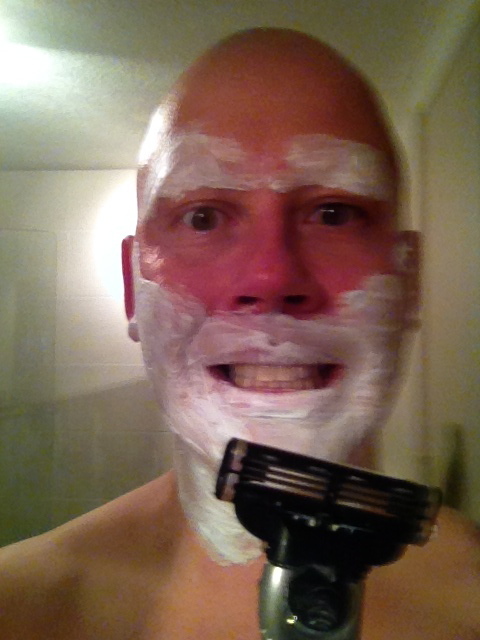 In the past few months I have decided to embrace the bald. Totally. 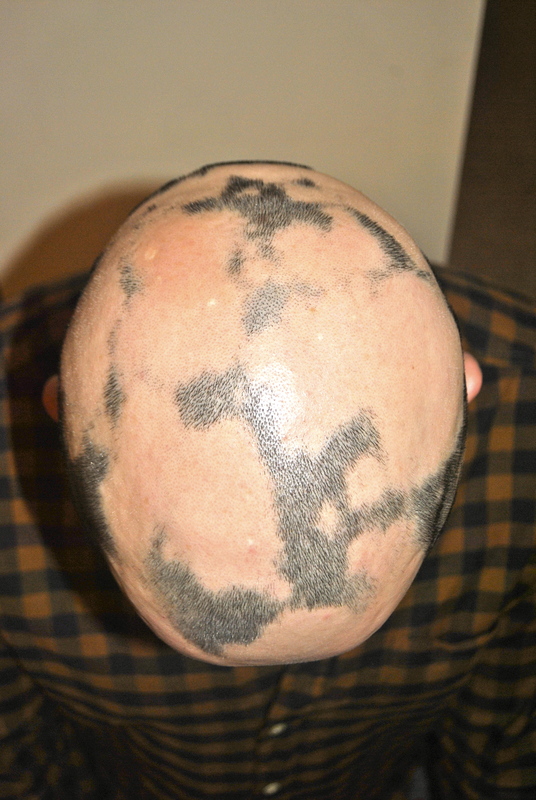 As my Alopecia has progressed I have continually lost further hair and the holes/patches/crop circles have gradually increased in size and joined up with each other. The above ‘joined up approach’ has also been true of my eyebrows. Starting with a rather fashionable looking scar shape on one eyebrow (image at the left) and then gradually turning into the usual ‘dog with mange’ look that the top of my head has. I hadn’t said earlier – but during this time – my eyebrows really got to me! As they are a really noticeable facial feature – used to show emotion and be expressive. My set used to be pretty impressive. Think caterpillar, think the Gallagher brothers from Oasis. 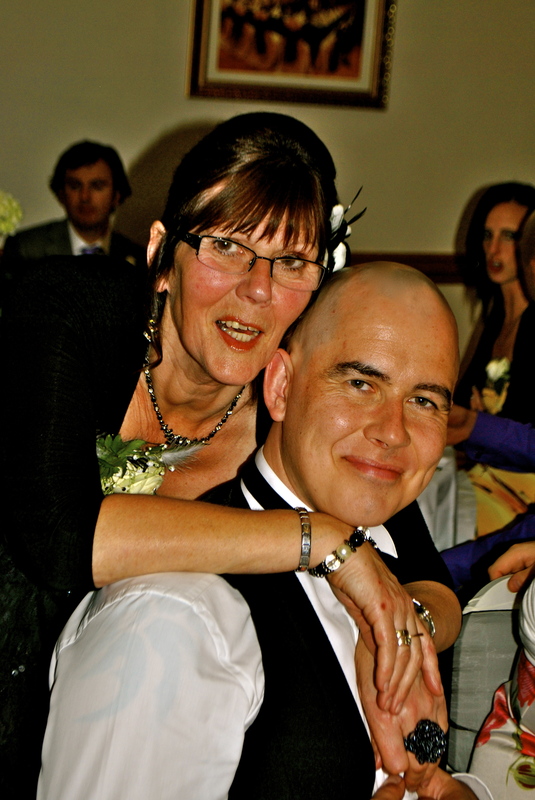 It wasn’t until the wedding and I was visiting home (The Lake District – if anyone is interested) that my Mam suggested “Use a dod of eyebrow pencil and nobody will notice!” “I couldn’t do that – I would look like a drunk transvestite who had lost their wig” was my immediate response. 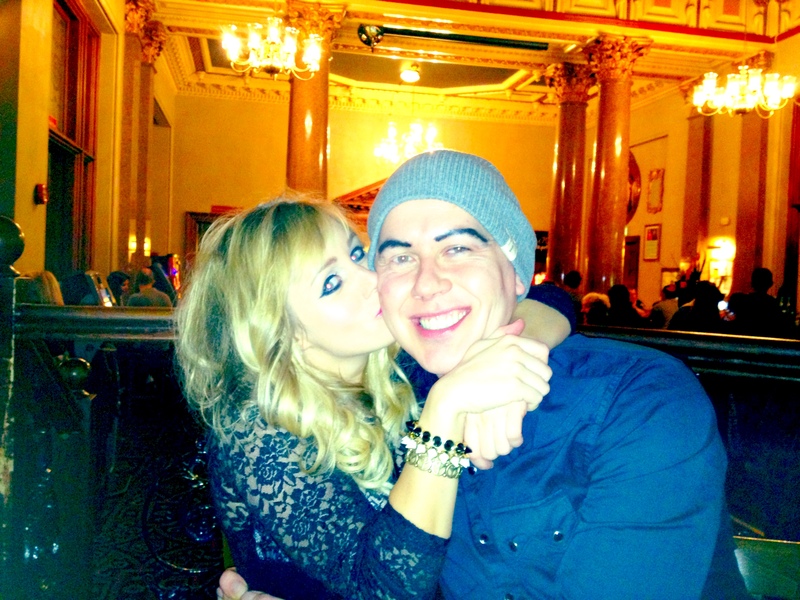 Undettered – my Mam bought me said pencil – in actual fact it was a Kohl black eyeliner pencil. She handed me it, smiled and continued getting ready for the wedding. I had never thought of life as a make up artist but I didn’t do a bad job (if I do say so myself)! I felt really comfortable with my ‘restored eyebrows and they managed to stay put for quite a while. However – water/rain/sweat are not a good mix and they do come off if you rub your face regularly! Rain will now be your enemy – always carry a hat or umbrella! 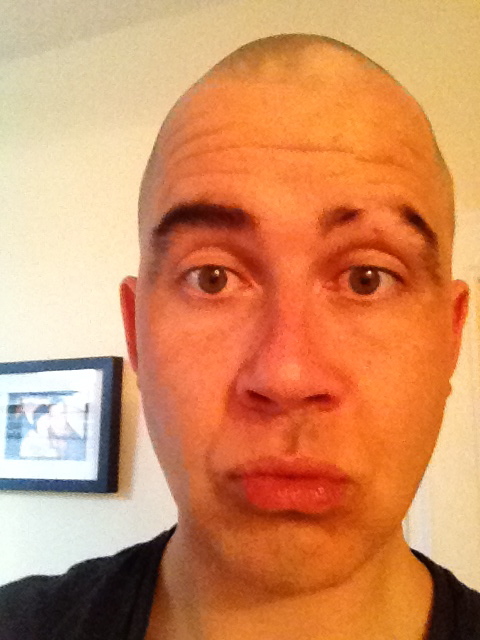 I had a pencilled eyebrow over Xmas 2012 when i travelled to Los Angeles. It wasn’t much fun going on rides at Universal Studios that sprayed you with water! All of the photos taken on rides show me with a hood round my face, body cramped in fear that I would come off the ride looking like Alice Cooper! Funny looking back but kind of a literal ‘wet blanket’ at the time. I never realised until I started pencilling that I rubbed my face so much. It was especially embarrassing during one 2 hour work meeting. 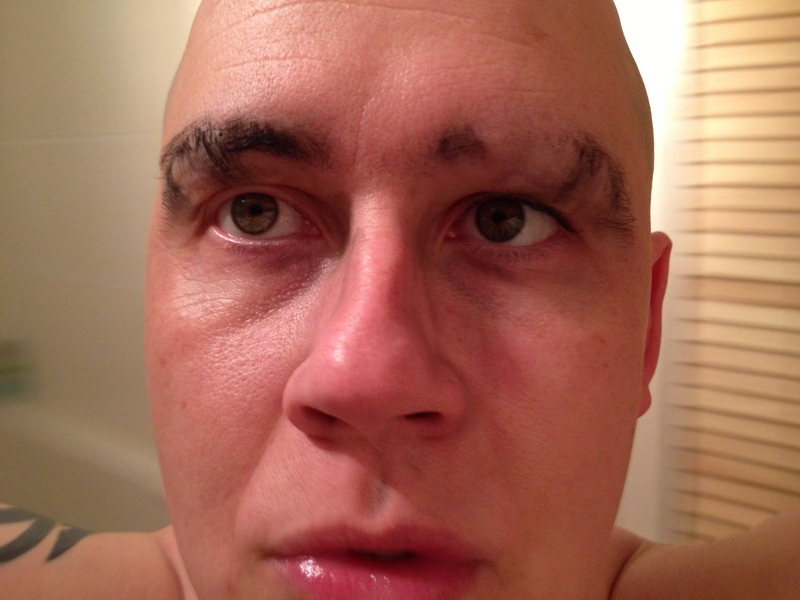 I came out – went to the loo and saw a black smear right across my face and a patchy eyebrow! I shuddered then laughed – Thanks colleagues for just staring and ignoring!! There comes a time when the patches you are pencilling outweigh what is left of your actual eyebrows. I would suggest stopping then – or possibly before. I toyed with the idea of stopping but then panicked bout my eyebrows! Argh – what would I do. 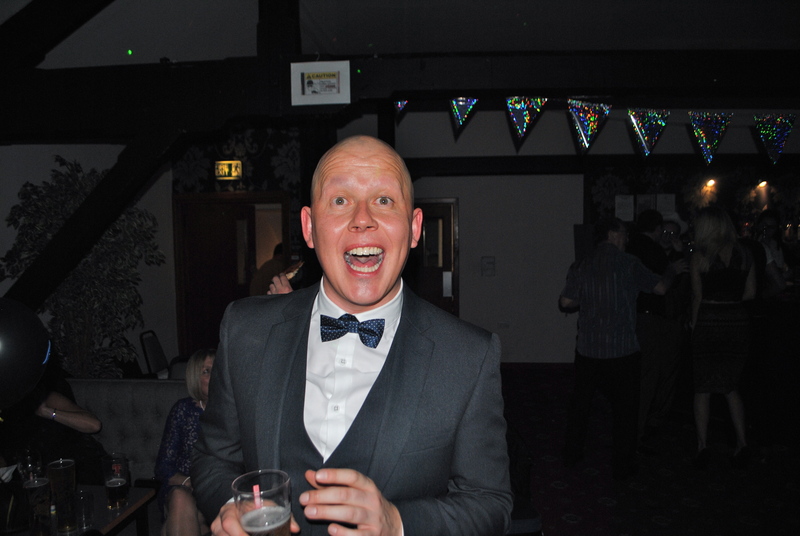 This picture of me taken on a night out – with big shiny eyebrows was my deciding factor. I didn’t realise how obvious they had become. When you out feminize a feminine creature like Abi – it’s time to man up and get rid. So I did. The next day I buzzed them right off. Spectacles and making a spectacle. . . . . 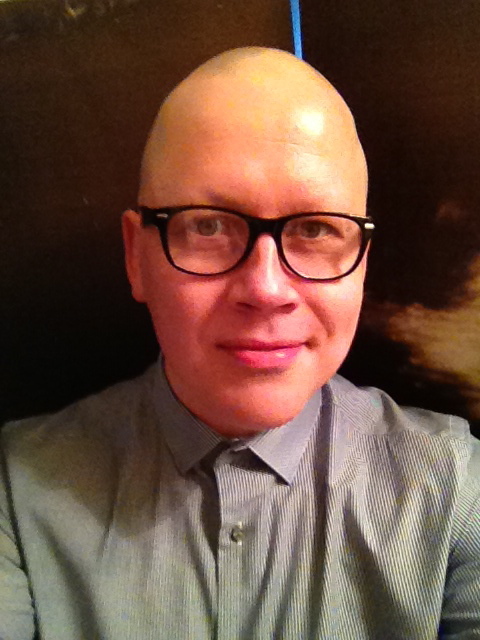 Immediately after shaving off my balding slugs, I tried to hide my lack of eyebrows with thick framed glasses. My thought was that I would rather blend in with a large part of society and become a glasses wearer. Hiding my eyebrows behind a vision problem? Seemed the perfect solution at the time. I did this for about a week or two with a fair bit of success. Then I attended a job interview and became really nervous as I thought they were looking through my (non precription) glasses and judging me. I fluffed the interview when she said “the next, practical session takes place upstairs“. This (filled me with dread – I will explain why in a second). “Is it back through the floor we just walked” was my rather odd reply. “Why does it matter where it is?” was her puzzled response. It mattered to me because I didn’t want to shuffle past potential new workmates with my fake glasses. Paranoia overload. This didn’t work for me but may for some – especially if you are already a glasses wearer – or can swagger away with the best of them and pull off the look. Maybe if I hadn’t gone for hipster glasses I would have gotten away with it?! What do you all think? ← Finally taking the plunge and chopping the locks. Wow. I am stunned at how alike yours and mine alopecia stories are .!! I’m about just over a year in and although coping much much better I still get that sinking feeling every now and then. Love reading your blog as it could be me writing it. Keep strong and be happy. Cheers Neil! Lt me know how you progress too! I am going to post a timeline of photos shortly so people can see the changes over the months. Once I get the photos sorted.